A creative combination of colour and shape are displayed in our Bevelled Collection. These dual glazed door panels show the wide variety of effects that can be achieved with bevels, jewels and colour transforming any entrance. We can also design totally original panels to suit your individual requirements using an extensive range of standard bevelled glass components. Size guide :- Half panels - 300mm wide x 1000mm high. Please email your requirements for a quick quote. Bevelled door half panels and full length panels demonstrate the full potential of this stylish looking glass. Size guide :- Half panels - 650mm wide x 1000mm high, Full length panels 650mm wide x 2000mm high. 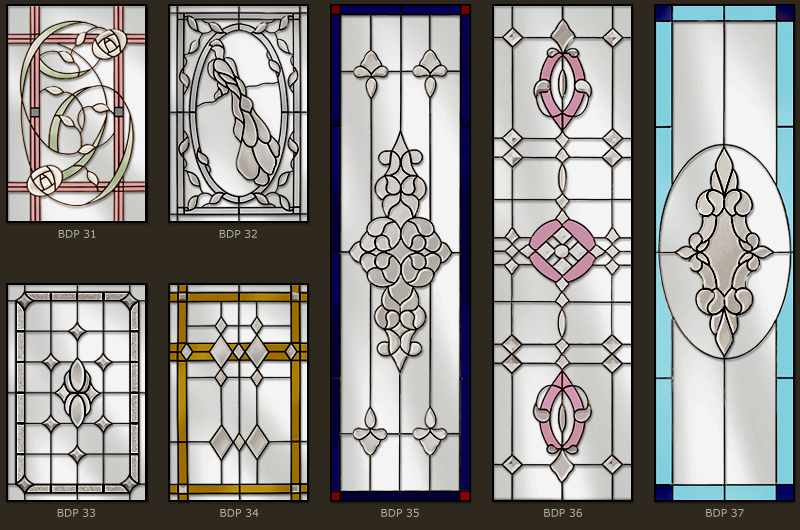 Arched top inset borders flowing around these designs is another way of creating a grand entrance to your property. Please email your requirements for a quick quote.